Wild Rumpus invites you to read with us! Each year, Wild Rumpus picks one middle grade book and one young adult/adult book for a community reading event which goes throughout the month of August. Then, at the end of the month, we'll host parties with the authors (one for each book). The books are available at Wild Rumpus with a 20% discount. Join us for this fun and engaging community event! Finally, the day we've all been waiting for, is (almost) here. Klaatu Terminus, the final book in the Klaatu Diskos trilogy comes out on April 8th, and we're bursting with curiosity and excitement. It's hard to describe this complicated and stunning trilogy. It includes: the rise and fall of societies and religions, maggot-like creatures, and disks that you can step through to travel to other times. The plot twists and turns through time, and we don't know how Pete Hautman kept it all straight when he wrote it. In celebration of the release of Klaatu Terminus, we are going to have a big party, complete with arugula and goat cheese burgers. Come to Wild Rumpus on Thursday, April 24th at 6:30PM to party with Pete Hautman and us. Also, read all three books (Obsidian Blade, Cydonian Pyramid, and of course, Klaatu Terminus). Your mind will be blown. Sci-Fi Alert! If you're looking for brave new worlds to explore, Hicklebee's is the place to be! Authors PETE HAUTMAN & JENN REESE will drop by Hicklebee's for a casual meet & greet. Thursday, April 10 at 3:30. PETE HAUTMAN, winner of the National Book Award for Godless, is on tour with his third and final book in The Klaatu Diskos trilogy, The Klaatu Terminus. JENN REESE's book, Above World, was a finalist for the Andre Norton Award. She'll be showing off the final book in the trilogy that began the Above World series, HORIZON. We like Pete Hautman's style. In fact, our teen book club likes his style so much, they have read four of his books (Godless, Invisible, Rash, and How to Steal a Car)—not to mention the Hautman books they've each read on their own. One of the things we like about National Book Award winner Pete Hautman is how extremely diverse his books are. From realistic fiction to futurist sci-fi to really good vampire stories before vampire stories were trendy, he writes it all. We are extremely excited about Pete's new book, The Cydonian Pyramid. It's the second book in The Klaatu Diskos sci-fi trilogy (if you haven't read the first, The Obsidian Blade, you are truly missing out). It's got pyramids, nanobots, and time travelling maggots. What more do you want? So come to Wild Rumpus on Saturday, June 1 at 11AM to talk about time travel and pink maggots. It's going to be fantastic. pete hautman discusses Blank Confession. 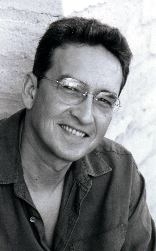 Pete Hautman. Maggie Stiefvater. Eliot Schrefer. Anna Waggener. Four amazing authors. One awe inspiring night. Come to Intermedia Arts on Friday, October 5th at 7pm for an event you do not want to miss. Do we need to say more? Pete Hautman, Rash. ; Walter Dean Myers, Lockdown. Chicago Public Library discusses Godless. Pete Hautman's book Otherwood is currently available from LibraryThing Early Reviewers. Pete Hautman's book Eden West was available from LibraryThing Early Reviewers. Pete Hautman's book Twin Cities Noir: The Expanded Edition was available from LibraryThing Early Reviewers. Pete Hautman is currently considered a "single author." If one or more works are by a distinct, homonymous authors, go ahead and split the author. Pete Hautman is composed of 3 names. You can examine and separate out names.